In the run up to series 8 of Doctor Who, the official BBC website has been updating its blog feature to introduce new characters that will appear in the new series. These characters are usually played by well known British actors and actresses such as Michelle Gomez, Frank Skinner, Tom Riley and Hermione Norris. The announcements made via the BBC’s Doctor Who blog break the news about their casting days or just hours before they begin filming so as to release the news before photos are taken by journalists. The posts vary in the amount of information given. Some just announce the actor’s casting and background whilst others also add the character’s name or an image of the actor in costume. Without fail, there is a short quote from both the actor and Steven Moffat in every article. The quick quotes are usually about how excited the actor is to join the programme. However, the quotes seem to be more zany and superficial as each post is published. It seems that they are acting as the equivalent of soundbites – short (sometimes edited) quotes to summarise the position of the speaker and usually contain “buzzwords”. Soundbites can sometimes be misleading and manipulated to create the initial interest from the listener before the wider context is examined. The quotes in the posts on the official website seem to be full of buzzwords and of a certain style. Do these quick quotes excite the reader by the overly positive announcements for the series (and subsequently building expectation)? Or do they fill the fan with dread as they seem edited, misleading and a little bit fake? 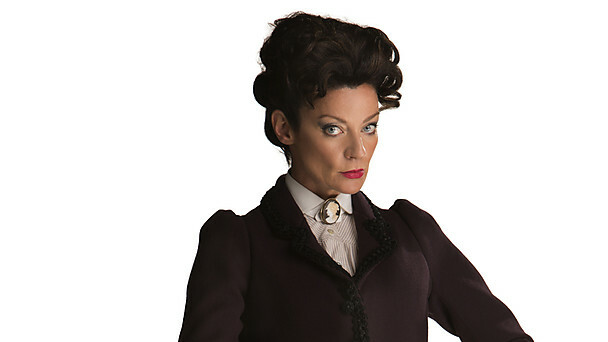 In the latest announcement, posted early this morning before outside filming got under way in Cardiff City Centre, Michelle Gomez was revealed as the character “Gateskeeper of the Nethersphere”. The article featured an image of Michelle Gomez in costume and programmes she has already starred in. It also included a quick quote from Michelle and Steven. To me, Michelle Gomez’s quote seems a bit out of place. It feels like it’s been plucked and edited out of a longer interview or conversation. The beginning of it especially seems like an answer to a question rather than a standalone quote. Steven’s on the other hand this time is a better quote than usual. It is actually intriguing and could interest fans in her character. “and a tiny bit satanic” is an enigmatic hint towards her character. It suggests that she could be a villain but that this may be shown subtly. It makes fans curious of what her character will bring and how she will affect the Doctor. Although Moffat’s quick quote this time is enticing and intriguing, I usually find his quotes in articles like these tiresome and fake. They’re ok – welcoming the cast member, being excited to work with them and hinting at their characters. That’s all fine – the quick quotes are put to good use and exciting fans about what’s in store next series. However, I find that the endings of the quotes tend to let him down and the credibility and excitement built up when reading the quote is undermined. The endings are like jokes or asides. For example, he ended his quick quote for the Frank Skinner announcement with “Hopefully he’ll get out of my garden now” in response to Skinner’s eagerness to join the programme. It seemed like an unnecessary joke which trivialises Skinner’s casting. It makes what Moffat has said before lose credibility slightly. I’m not saying that jokes or wit shouldn’t be used in a quick quote but I think it makes the sentiment feel fake. It reminds me of when actors/directors/singers etc appear on talk shows and feel the need to prove that they are funny and likeable with contrived “anecdotes”. I’m aware that the above paragraph seems a bit like I am criticising Moffat. This is not the case – I don’t have a vendetta against him like some fans appear to have. I think he’s a good writer even though I disagree with the direction he takes now and again. I just believe that the quotes used in articles like those I’ve mentioned are designed to be like soundbites. It’s also not clear whether the quotes are ad verbatim or if they have been edited by whoever creates the press releases. The buzzwords and witty asides don’t quite work. It is hard to communicate humour and passion through writing – you can’t get the same tone or intention when speech is written as you would when you experience it face to face. It’s harder to guess the tone and people can interpret these quotes in different ways.